Basket Whiz: How have you been doing business in the recession? Did it cause you to tighten your spending or lay off employees? ...We spent money only when we needed to; incorporating the business, web-site building, packaging, priority certifications, etc. ... We also focused on a core product, the gourmet pretzel with a few flavors. We did not try to be everything to everyone and over extend our budget, inventory, or talent. ...Building a strong foundation and working out kinks during a low economic time point meant as the economy picked up, we were prepared and ready when the bigger opportunities presented themselves. We are happy to say we have never had to cut jobs and as of the numbers through 2011 have grown 1,500% since inception in 2007. ...From the time Mom and I shook hands to today; there has not been a day without something new to experience, to learn, to overcome, or to revel in. Basket Whiz: When did you decide to branch out? MOI: Mom and I both knew from the beginning that to keep a strong, steady business with something unique like gourmet pretzels, we needed to branch out. It was/is important not to put all our eggs in one basket, or in our case, one industry. Because we see so many uses and opportunities for our product, there has always be a highly diverse clientele. "This award recognizes an alum who promotes the values and elevates the profile of Webster University through leadership in his/her profession, contributions to society through public service, and ongoing support of the University. This person must be an alumna/us of Webster University who received his/her undergraduate degree within the last 10 years of being nominated and is 35 years of age or younger." Taran has received national attention ever since Mom’s Originals' treats were such a hit in the gift bags for the Sports Emmy Awards in Spring 2010. Mom’s Originals was then invited to include its product in the 37th Annual Daytime Entertainment Emmy Awards gift bags. Taran and her mom appeared on the red carpet in Las Vegas in June 2010 to hand out treats to the stars. Internet domain registrar and web hosting company GoDaddy.com has since highlighted Taran and MomsOriginals.com as a success story for “Quick Shopping Cart” on their website. And the recognition and awards keep coming: in January of this year, Taran received the Missouri’s AgriMissouri Member of the Year Award for her business’ outstanding marketing, branding, commitment to community and overall excellence as a role model for Missouri-based businesses. What is next for this young alumna/entrepreneur? Two words can describe it: great success! Article Excerpts:... Taran Hercules, President of Mom's Originals, an online gourmet pretzel store based in St. Louis, Mo., says given her positive experience with GoDaddy so far, she would be interested in using additional tools and resources as they become available. Mom's Originals, launched in 2008, started with GoDaddy's web hosting and quick shopping cart features. Hercules says she's added seeral services like email since then. Sweet indulgences combining the right combination of sweet and salty flavors will please the palate ... and have customers coming back for more. Mom's Originals in St. Louis has set itself apart from the many chocolate-dipped pretzel rods available. The company's extra layer of protection - a hand-wrapping of soft caramel - is key. making breakage during shipments obsolete,"
says Taran Hensley, who co-owns the company with her mother, Jody. President and Co-Owner of Mom's Originals Gourmet Pretzels, featured at the Emmy Awards and the 2011 World Series Gala. Taran is one of the region's youngest business owners to start and grow a business to the size she has so quickly. 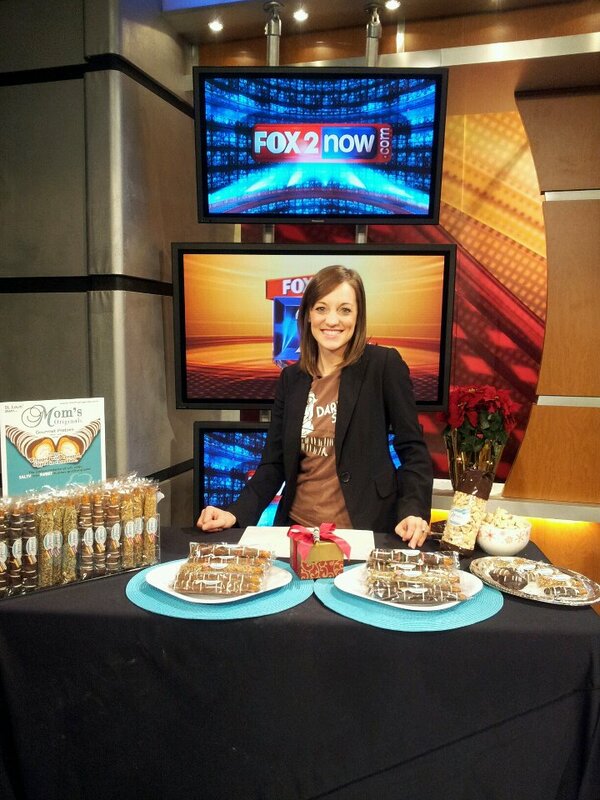 Learn how Jody Hensley and her daughter Taran teamed up to start their gourmet treat company. Life is too short and too delicious not to try something new at least once a month. We stopped by the Fancy Food Show last month and was once again amazed by the variety of products represented by companies from around the world. Although there are more products that we will recommend throughout the year, below you will find our top 10 picks from the show that really caught our eye and fancied our taste buds. Ah, who can resist a salty pretzel stick wrapped in chocolate and nuts? Not us. They were really love at first sight and bite. These gourmet pretzel rods have a layer of caramel that is mixed with dark and milk chocolate and rolled in pecans or walnuts. The fact that they come individually wrapped allows for a little bit of indulgence control but best of all they are perfect for an on-the-go snack. The game might disappoint, but the food shouldn't. It doesn’t matter if you’re in it for the love of football or the crazy commercials—the Super Bowl is a great excuse to throw a party. Creating a spread that goes beyond the typical fare will be appreciated by all of your guests. So whether you’re glued to the TV or just hanging out, here are some great ideas to make food the main event. Drop a bowl of Mom’s Mix on the coffee table and watch it disappear. A hearty mix of pretzels, peanuts, rice and corn cereals, and candy-coated chocolates all drizzled in white chocolate, this mix is an irresistible balance of salty and sweet. "Not all of us are creative in the kitchen, but that doesn't mean we can't give the gift of decadent deliciousness!" "Those who are willing to fail are those who will ultimately succeed." "I believe one of the most challenging assignments is to write about one’s self. How can I sum up my quirky personality, competitive nature, devotions, imaginative thinking, thirst for success, love of life, and constant craving for adventure? Maybe I just did." My biggest career accomplishment has to be Mom’s Originals in its totality. We literally rejoice with each new learned process, account, employee, and fan message. To pin-point one event or milestone as “the biggest” would immediately be an outdated statement. From the time Mom and I shook hands to today; there has not been a day without something new to experience, to learn, to overcome, or to revel in. While I only aspire to be “the best me I can be”, if I had to choose one other person it would most certainly be my Mom. Her pleasant nature, joyful attitude, love and kindness are always refreshing. Not only is she sugar, spice, and everything nice, she is also smart, secure, and independent. These simple yet powerful traits are ones that I hope people will also see in me. To bring the company my Mother and I started from ground floor to global recognition. Marrying my Mr. Right next year and maintaining ideal balance between work and play. My first experience has to be my most memorable. When I was young my parents and I added magnets to little figurines, put them in little stockings, and handed them out to the workers at The Disabled & Handicapped Workshop near our home in California. To see the appreciation on their faces taught me firsthand at a young age the joys of giving. I was born in Montana; was at the starting line of the Iditarod when I lived in Alaska; began my modeling career when I lived in California; my only overnight hospital stay was when I studied abroad in Thailand; I walked the Great Wall of China at age 25; finally, I have not owned a microwave in four years. Q: How do you market a company with a great product, but a small budget? A: Non-traditional marketing and social media. The sweetness doesn't stop with the pretzels. As a key tactic in her nontraditional marketing plan, Taran Hensley, President of Mom's Originals, Inc., works to make a positive impact in the community. She knows that her customers want to do business with companies that care. The Top Young Entrepreneurs in this section exemplify a kind of brash and raw entrepreneurship not always found. Bucking trends by unapologetically following their passion and showing a penchant for business that is usually reserved for their elder colleagues. So when Hensley was downsized from her corporate job as a marketing specialist, she kept her father’s advice in mind. She saw an opportunity in helping her mom, Jody, turn her hobby of making gourmet pretzels into a business. “We shook hands, and I took the initiative to take on the sales and marketing since my mom had the product,” says Hensley. Hensley has also grown her team, which she refers to as the MOI family, to 12 full- and part-time employees. “The smartest thing we have done as a business is bringing in the right people, for the right job, at the right time,” she says. Last month I attended the Drink Local Wine conference featuring Missouri Wines. There were lovely gift bags for the attendees filled with wine accessories and a few delicious snacks. 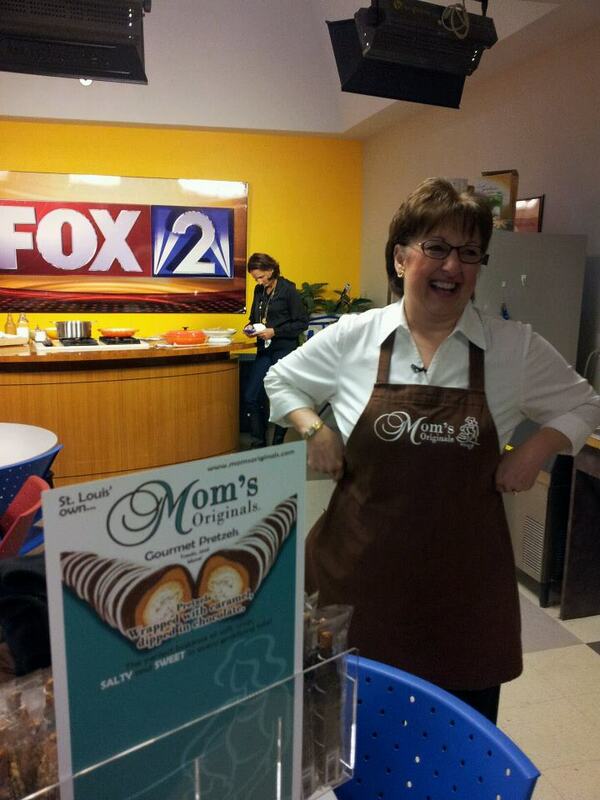 One that immediately caught my attention were the chocolate dipped pretzels from the St. Louis company Mom’s Originals. They take snacking to a new level by elevating pretzels to dessert status. I was a little leery because I am not always a huge fan of nuts. But soon I was lost in the caramel/chocolate/salty goodness. There’s something about that sweet/salty combination that gets me every time. And I even loved the pecans. By the way, I wasn’t compensated in any way for this post. I just really dig their pretzels. Sourcing unique and quality products to make up gift baskets can be a time consuming task. To make this a whole lot easier however there is momsoriginals.com. Here you are going to find delicious treats that will add the final touches to any gift basket you want, that speaks of only the best in quality, taste and looks. Although you will find several delectables here to choose from, you will most certainly not want to pass up the best of the best which is the gourmet pretzels. These are ultra fresh pretzels that are coated with an exquisite layer of caramel, then hand dipped in the finest chocolate, and rolled in pecans or walnuts, or white chocolate is generously drizzled over them. Finally they are each carefully wrapped for preservation and presentation. You may want to pick up a few extra when stocking up your gift basket inventory, as no doubt you will be tempted several times over just to try them out. We’ve got some great products and services offered by some moms who happen to live in and around the ‘Lou! Here are some of my favorite picks. The Omni Majestic Hotel, a 91-room, luxury boutique property located in the heart of downtown St. Louis has joined forces with Mom’s Originals Inc. in an agreement to offer a localized culinary experience to its guests. In a relentless effort to provide the finest in local flavor, guests of the Omni Majestic will receive the opportunity to experience the finest in luxury hotel accommodations as well as the refreshingly unique choice in Mom’s Gourmet Pretzels. Click the Emmy® to view our photos and press. What to get the locaores on your list? They've already stocked their larders with Missouri wine, locally made roasted coffee and plenty of jam from the farmer's market. Tickle their little local hearts with any one of these Missouri-made products. In 2007, Taran Hensley and her mom, Jody, became business partners. Having come to a crossroads in her career as a marketing specialist in the corporate world, Taran decided to take her skill set and apply it to the launch of Mom’s Originals, a gourmet pretzel company with the product made, of course, by Taran’s mom. MomsOriginals.com specializes in gourmet pretzel treats. This women-owned business is based out of St. Louis, Mo. and uses Quick Shopping Cart® to market and sell their pretzels online. Hensley (BA, Media Communications, 2003) is a marketing professional, an entrepreneur and president of Mom’s Originals, a local business specializing in gourmet pretzels, treats and more. Hensley and her mother Jody will travel to the ceremony to distribute their treats to stars traversing the red carpet. A HENSLEY HIGH: The local mother daughter team of Jody and Taran Hensley thought they’d scored big when they were asked to include their Mom’s Originals gourmet pretzels in gift bags that will be given out at this year’s Daytime Entertainment Emmy Awards show. And then they were invited to hit the red carpet and help hand out their amazing caramel-chocolate-pecan-walnut-dipped-wrapped-and-rolled pretzels at the 37th annual awards ceremony in Las Vegas on June 27. St. Louis’ own Mom’s Originals Gourmet Pretzels were among the goodies in the gift bags handed out April 26 at the 31st annual Sports Emmy Awards at Lincoln Center in New York. Jody Hensley and daughter Taran Hensley started the company in 2008 at the urging of friends and family, who loved mom’s pretzels, which are hand-wrapped in soft caramel and coated in chocolates and nuts. Yumm. Just like Facebook fan pages, you should consider what your Twitter profile offers visitors. What is the value to your followers and customers? Why should they care? What can you do for them? Mom’s Originals is known for gourmet pretzels, treats, and other confections. After pouring through different small business Twitter profiles, Mom’s Originals is, hands down, one of my favorites. With more than 2,000 followers, this Twitter profile is doing something right. While at first glance, I thought the background could be better optimized and they should be listed more with that many followers, I continued reviewing the profile. What I found was engagement. Not only does Mom’s Originals post content about products, this business has taken the time out to engage with followers. During my review, I noticed the Twitter stream (series of posts from Mom’s Originals) contained retweets, general statements, positive comments to other Twitter users, questions being asked, and product information. While most of us cringe at the thought of being in business with our mothers (“You’re wearing that to the board meeting?”), Taran Hensley and her mom Jody went into a business where twisted is acceptable. For 10 years, Jody made all sorts of delicious treats, especially cakes and gourmet pretzel rods; Taran was always nearby, lending a hand. Mom baked and Taran got a media degree. It was only a matter of time before mom’s handiwork was taken to a new level: Mom’s Original’s, Inc. Those pretzel rods are the company’s bread 'n' butter: a thick pretzel hand-wrapped with caramel and dipped in chocolate before being rolled in chopped nuts or simply drizzled with white chocolate. While the mom-and-daughter company caters to online customers, you can pick up Mom’s sweet ’n’ salty treats around town.